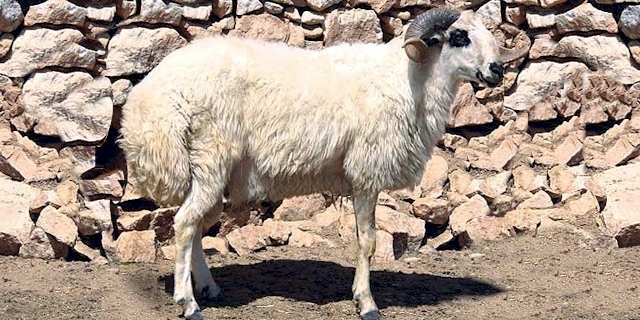 Daglic sheep are found primarily in western Anatolia in Turkey. They are a carpet wool breed used for both meat and dairy production. Typically they have black spots on their head and legs, the rams are usually horned and the ewes are polled. They are thought by some to be the origin of both the Chios and Kamakuyruk breeds. Daglic sheep have been adapted to live in a steppe climate. They are unicolored with a white body and black spots on their heads and legs. Daglic sheep have a short-fat tail. They live birth at 80 - 90% and twinning is rare (1 - 2%). Their average weight gain is approximately 179 g (6.3 oz) per day. At maturity, ewes grow to approximately 60 cm (24 in) at the withers and weigh 37.5 kg (83 lb). Lactation yields about 40–50 kg (88–110 lb) of milk and lasts for about 140 – 179 days.